My Canasta is all done! This is Lifetime Quilt Number 114. The pattern is Canasta by Miss Rosie's Quilt Company. The fabric is all by Fig Tree for Moda. It finished at 50" x 57". It has approximately 1,252 pieces. 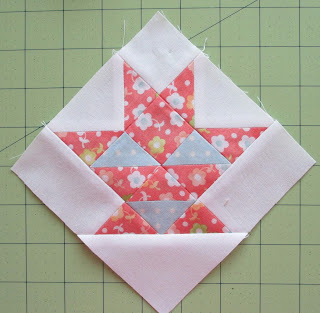 Thanks Sinta and Sherri for another great Schnibbles Sew Along. I can hardly wait to see what's up next! I've finished my baskets for Canasta, all 61 of them. And I found the perfect place for each one in my top. I really liked the random setting on the Canasta pattern cover, but thought that might be a little too much with all my assorted baskets, so they are going to be setting up straight. Someone asked about my fabric, it's all Fig Tree by Moda. Here's how I came up with all the different baskets, one piece of graph paper, one pencil, and one highlighter! Even though I drew them all up, I still wasn't sure how they would look when I put them all together. But I think they all turned out just fine. I don't get as much sewing done on the weekends as I do during the week, but I do have a few more Canasta basket blocks to show you. I've named this one "bikini basket"
The parade will be here before you know it, are you ready? I got another quilt home from the quilter. This project was a Schnibbles Sew Along from last April! The pattern was Summer Day, but I changed mine up a little and named it Summer Fun. And since my summer isn't over until I say it's over, I immediately hung this quilt up and intend to keep it up until summer is over. 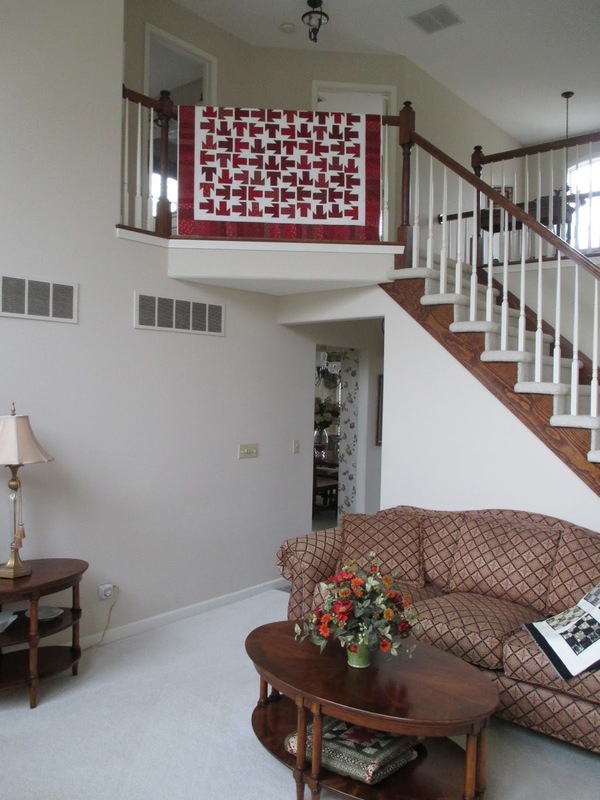 This was quilted by Dawn at The Sewing Basket in Charleston, Illinois. Here's a nice view of the back, she went with a custom design. I love the quilting, especially the quilting around these dots, like little rays of sunshine, perfect for a quilt named Summer Fun. I've made several quilts to hang in that spot in the guest room, but this is the first one I've gotten back from the quilter, "T" Stands for Thelma has been up quite awhile, and I thought it would be best to give that quilt a break from the sun. Then I threw it over the banister while I decided what to do with it (I don't like to fold quilts that I hang) and decided I liked it there, so "T" Stands for Thelma is still out, just in a different location. I'm going to town on my Canasta baskets. I thought it would be fun to make a variety of basket blocks, so far I've drawn up 23 different patterns. I think I'll make the parade, how about you? 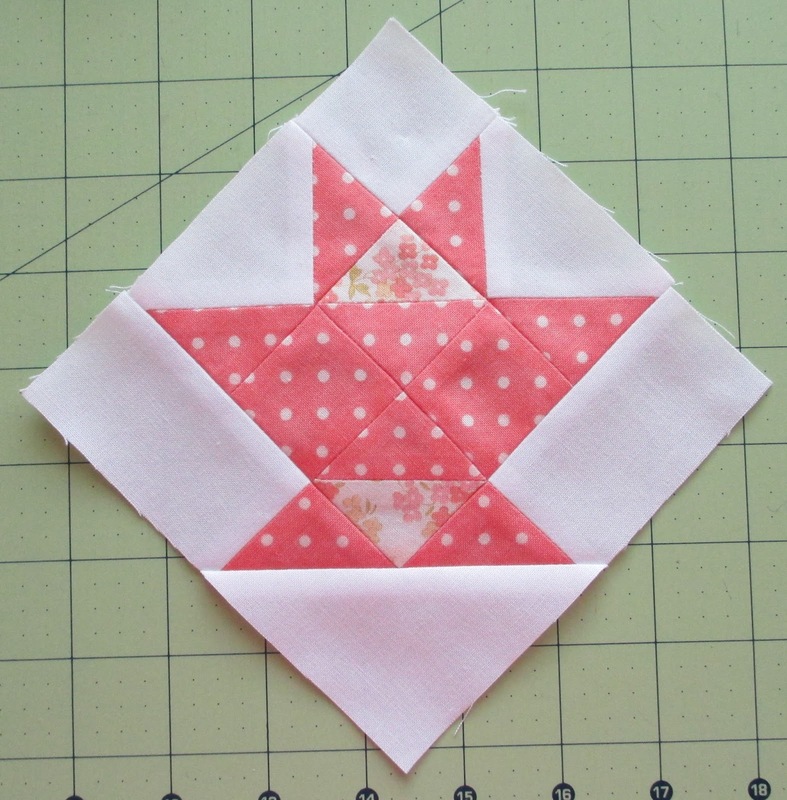 I've pieced all the small Dresden blocks for Dresden Doilies. I still need to make and appliqué the red centers, they look done because I took this picture of them sitting on my red ottoman!! These blocks have 14 blades and finish around 4 1/2". 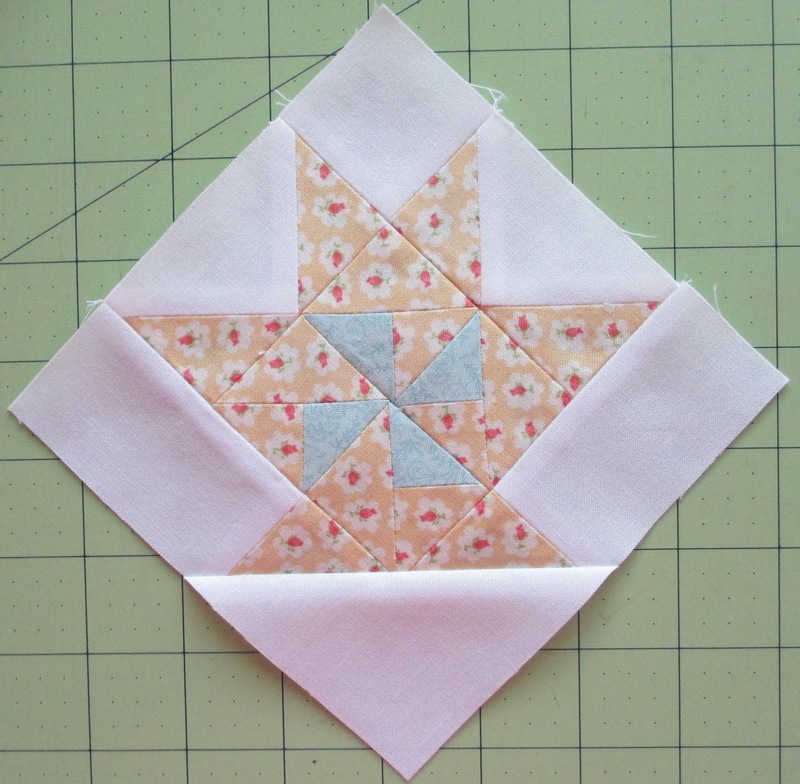 Now it's time to get going on Canasta, for Sinta and Sherri's Schnibbles Sew Along. Eleven days until the end of the month, I think I'm good, there's not much going on at my house from now until the parade. I'm making my version of Canasta using Fig Tree fabric. I have a bin of Fig Tree layer cakes, fat quarters and fat eighths that need to be used. So I dug through all the fabric and put together over 30 different "perfect" combinations of fabric. I plan to make the 61 block version of Canasta. I'm also thinking about changing up the basket pattern a little, maybe making some different baskets instead of 61 baskets exactly alike and exactly like the pattern, shocking, I know! Times a wastin', I hope you're able to squeeze in this project before the end of the month too! The days are already getting shorter and my morning walks are now taken in air that's just a little bit crisp, there's no denying it, fall is on the way. Technically fall starts Sunday, September 22. In my mind fall usually starts the Tuesday after Labor Day weekend, but not this year, fall may not start at my house until October. 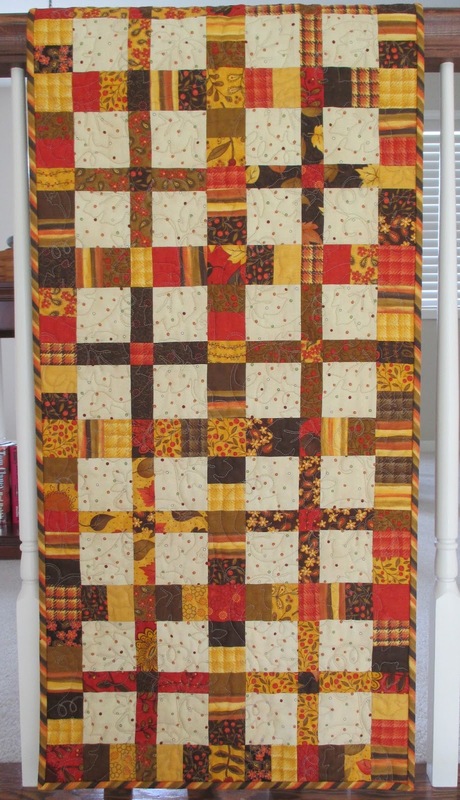 I have too much summer sewing yet to do to welcome fall into my household. I'm still working on my Dresden Doilies. I've machine appliquéd the large blocks to the backing, squared up the blocks, and have sewn them together. 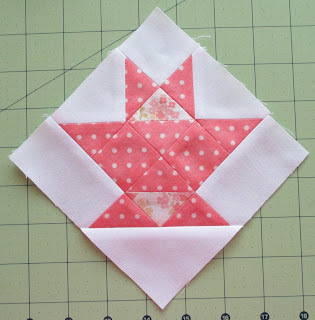 I still have small and medium blocks to piece and add to this project. 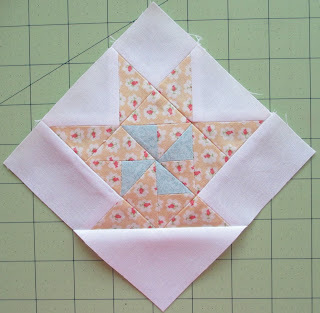 To stitch the large blocks I used sulky invisible thread. 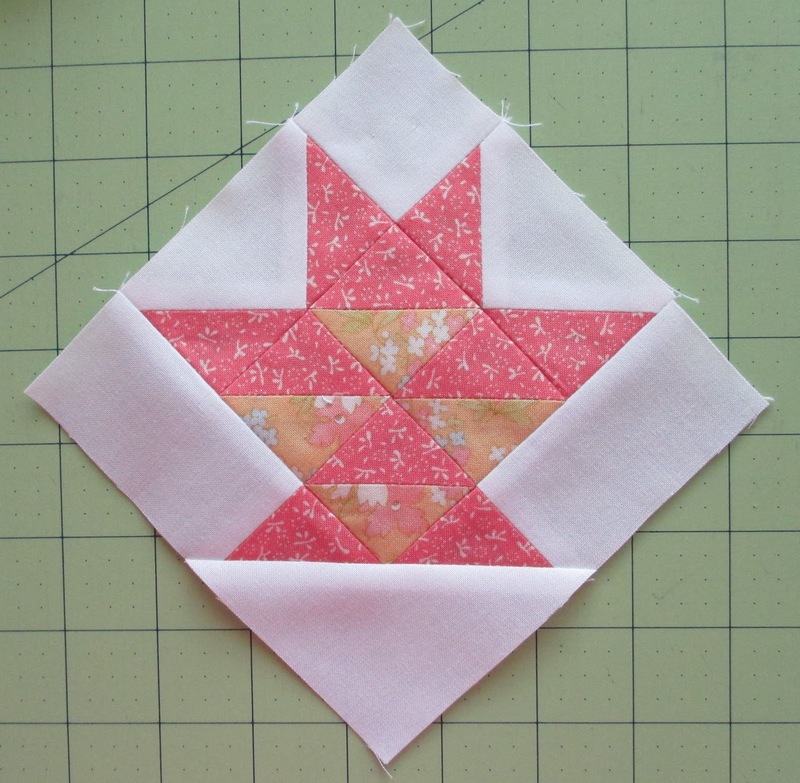 It was a breeze stitching these blocks because I had not combined them yet, so moving the single block through the machine was fast and easy. The next sets of blocks will have to be attached to this big project, I'm wondering how that will go. 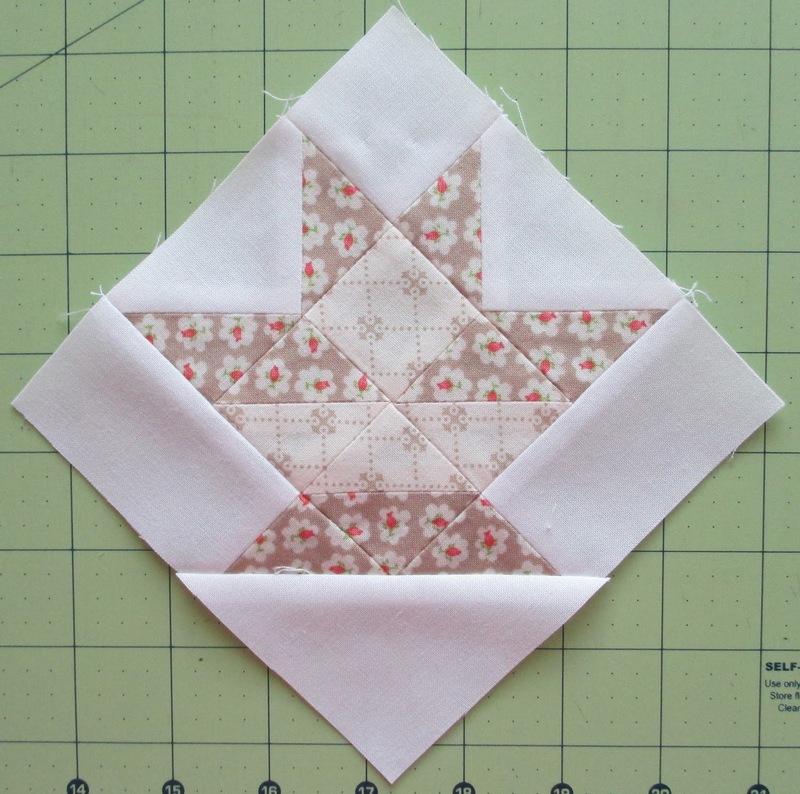 The Temecula Quilt Company gave us three settings for our itsy bitsy teenie weenie ridiculously cute basket blocks. 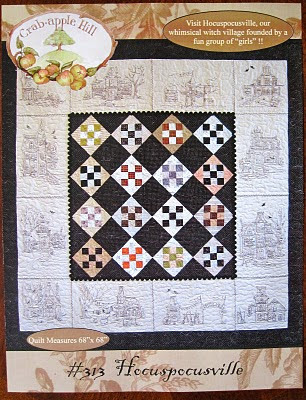 This was my favorite and I'm thrilled I have enough background fabric to make it. What I don't have are 50 IBTWRC basket blocks, I stopped at 30. Oh well, I loved making them, guess I'll just make more. 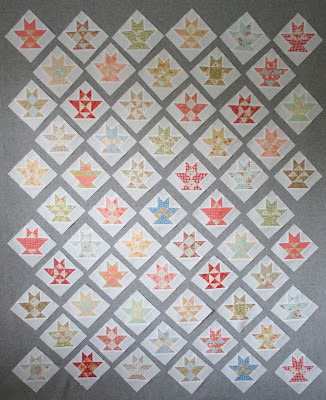 Canasta is the August YOS pattern and I'm not missing this parade! I plan to get started on this sooner as opposed to later! I love basket blocks and think this pattern is just adorable. I ordered the PDF version from Miss Rosie's online store. This pattern has several options and sizes, I'm hoping to make the big 61 block version that finishes somewhere around 57" x 57". Plus, I have this book that has nothing but what I would categorize as summer projects in it. 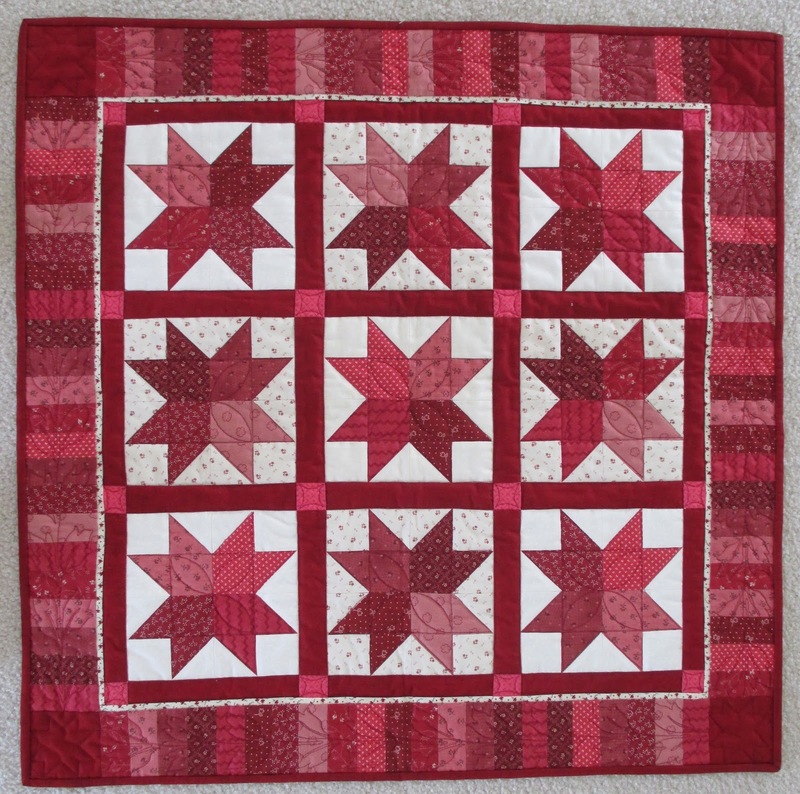 "hand quilted with love, patchwork projects inspired by a passion for quilting by Sarah Fielke. I didn't jump right on this book when it was first published because I thought it was a book explaining how to hand quilt a top, and I sure don't need a book telling me how to do something I'm never going to do. 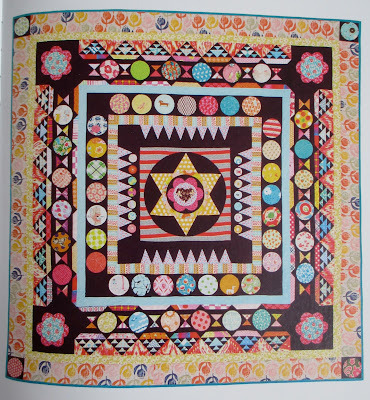 It wasn't until I started seeing projects on other blogs that I figured out it is a wonderful book of amazing patterns, 16 patterns to be exact, beautifully illustrated with huge color photos in a hardbound book. It's one of the nicest quality quilt books I've ever bought. Here are just a few of my favorite patterns. 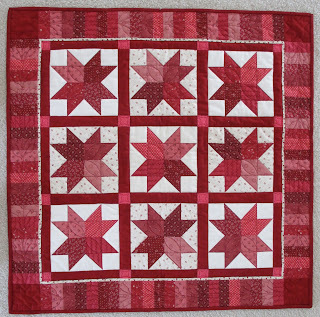 This is like my Nottingham Star civil war quilt, but with a modern spin, red, what's not to love? It's called "made in cherry". And this is "lady marmalade". There are projects in this book ranging from beginner to advanced. 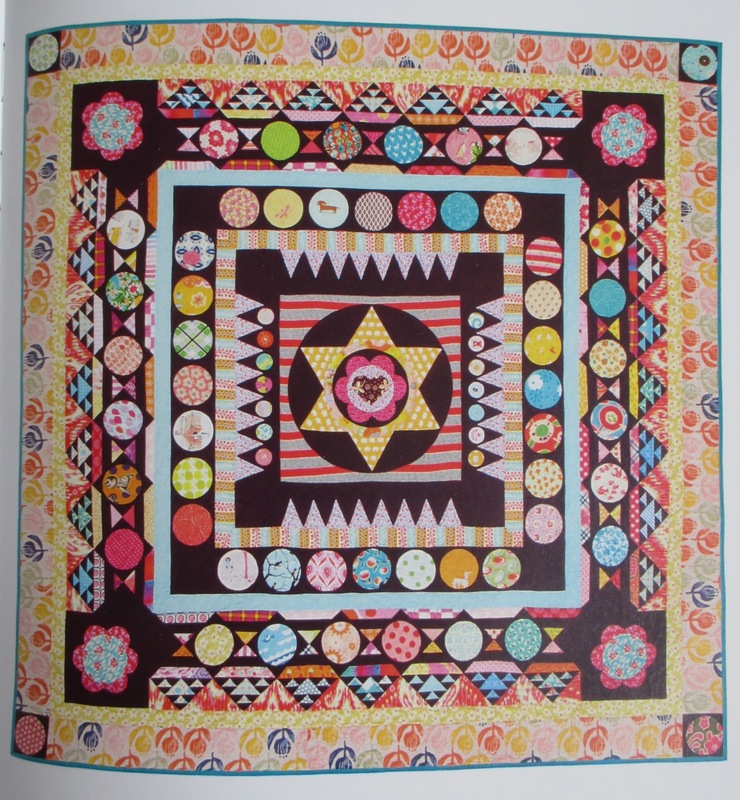 In the introduction, the author, Sarah Fielke, talks about her love of making quilts and says, "Try new things, be adventurous, and crack your own quilting code. Don't be hung up on whether something is right or wrong, or on whether you are a "modern quilter", a "traditional quilter", or even an "art quilter": just be a QUILTER, be creative and love what you do. It's what I do every day - and I can tell you, I'm a happy girl because of it," What wonderful advice, I'm taking it to heart, I plan to be a happy girl too! So even though I love sewing bright and colorful projects in the summer, there's no reason I can't do the same this fall, and winter. This could be the start of something new for me! I got three quilts back from the quilter and I love them all. Abby at Latimer Lane Quilting did the quilting for these mini quilts. This is the first time I have used Abby and it won't be the last. This is last August's Schnibbles, Dimestore. Abby chose a nice leafy design for this fall runner. This is Lifetime Quilt # 94 if you have any questions. I promised this quilt to someone after I finished piecing it, good thing Abby was able to get it done so quickly, it's almost time to use it. This is last April's Schnibbles, Hat Trick. I won't be needing this one until next spring, but I'm thrilled to have it done and ready to go. Abby went with an all over circle design for this project. You know me and dots, I could not love this design more. This is Lifetime Quilt Number 103 if you have any questions. And last but not least, Tickle by Miss Rosie's Quilt Co is done too. Abby did a custom job on this top, which pleased me since this project is extra special, I made it using the FQS Thelma Bundle. 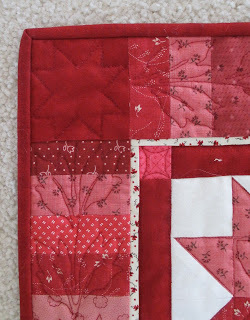 I LOVE the star design in that plain red corner block, and also the viney design in the border. 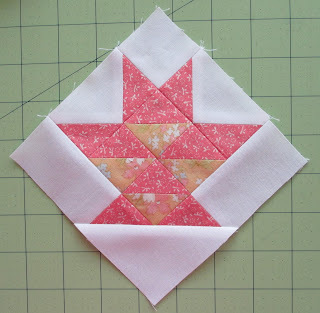 There's a lot of quilting going on for such a small project, Abby really brought this top to life. This is Lifetime Quilt Number 101, Tickled Red. 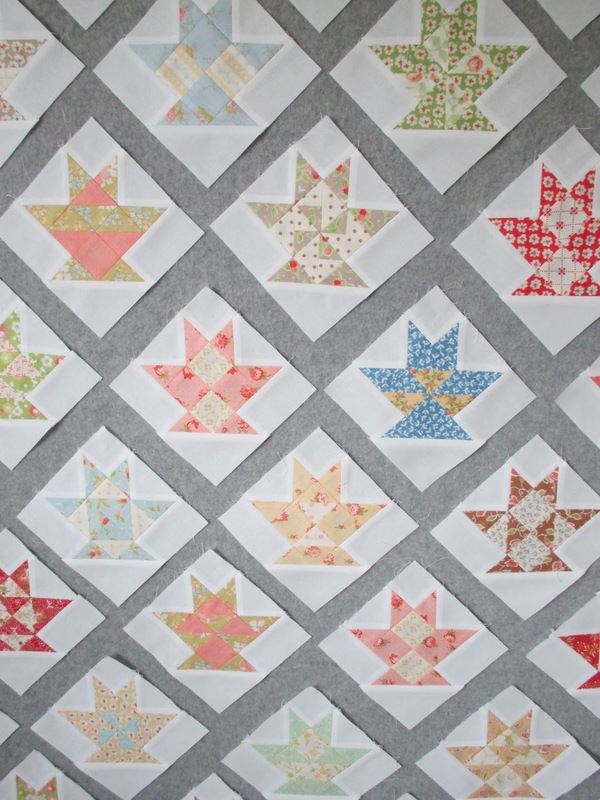 Thanks Abby for quilting these small projects for me, they would still be hanging in my closet if it weren't for you. 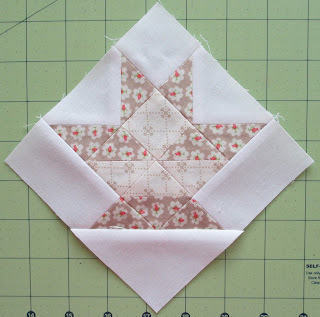 If you would like Abby to do some quilting for you, click on Latimer Lane in my Favorites List for Abby's blog that lists her contact information.